Get Out & Go Tours offers fully-supported tours on the C&O Canal National Historical Park Towpath, and the Great Allegheny Passage (GAP) between Pittsburgh, PA and Washington, DC, and a seven-day, seven-rail-trail "Tour of the Virginias," for a week of riding on VA and WV's best rail-trails. Join our mailing list by sending your email address to info@getoutandgo.biz, and learn about the Canal through newsletter articles, and be alerted to our upcoming tours, and events, keep up to date on our company progress, and then join us for a tour through some of the most beautiful scenery on the East Coast, free of auto traffic, and anchored by premier cultural and historical cities. A Week of Virginia and West Virginia's Best Rail Trails, including the Rail Trail Hall of Fame Virginia Creeper Trail! Shuttle from the Dulles airport area to southern VA for seven days of rail trail riding, including the High Bridge State Park Trail, New River State Trail, Virginia Creeper Trail, Greenbriar River Trail, Blackwater Canyon or Allegheny Highlands Trail, and the North Bend Rail Trail, before shuttling back to reality. A green adventure for sure, this all-trail trip takes you through some of the most scenic, wooded areas of the Virginias, with trails full of trestles and tunnels. We even ride the Cass Scenic Railroad to the top of Bald Knob and back one day. We use economy hotel lodging for most of the nights, with one B&B and an historic 125+ year old luxury hotel for the final night in Parkersburg, WV. Our typical trailside support, picnic style lunches, and group dinners will prevail. Remote trails with wonderful scenery! Cost: $1,400. Optional single occupancy available for $350 additional. Optional hybrid bicycle rental available for $100.00. Registration deadline July 1, 2017 (inquire if after this date). Limit: 10 riders. Read more. The Great Allegheny Passage-C&O Canal route is very popular, as this 350 mile journey between Pittsburgh, PA and Washington, DC is a premier, car-free journey, that is a highlight in the Rail Trail Hall of Fame. Come along as we provide you with “full support.” We meet in DC and shuttle to Pittsburgh the first morning, allowing the afternoon/evening for you to bike around and sight-see Pittsburgh, then we spend seven days riding over the mountains and along the winding Potomac River to Washington, DC, in the cooler, late summer season. 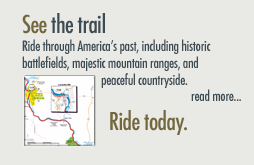 The tour features 35-60 mile days, with shuttle options for shorter daily mileage, indoor lodging, hearty meals, daily Snack GOs with snacks and drinks, map and cue cards, an included tour of Fallingwater, a Frank Lloyd Wright architected home, an optional side-tour of Antietam Battlefield, and time to explore Harpers Ferry, WV, on your way to our Nation’s Capital. Can’t make the full tour? Join us for just one segment! 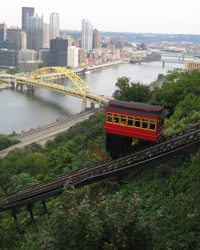 The 4-day Great Allegheny Passage option September 9-12 picks you up in Cumberland, MD, where you leave your car, late morning of shuttle day, and whisks you off to Pittsburgh with the group, where you can explore Pittsburgh on your own the afternoon of the first day, then ride the GAP with the group, and depart when you reach Cumberland. Three days of riding (52 miles, 30 miles, 61 miles), three nights of hotel, meals, and a tour of Fallingwater are included. The 5-day C&O Canal Tour option September 12-16, starting with shuttle from DC and a 23 mile downhill ride on the Great Allegheny Passage into Cumberland, MD the afternoon of shuttle day, where we join the Pittsburgh to DC group for 4 days riding to Hancock, MD (60 miles), Shepherdstown, WV (52-60 miles), Leesburg, VA (37-43 miles), and Georgetown, DC (36-42 miles). Cost, $1,000. Optional single occupancy $350 additional. Optional hybrid bike rental, $100.00. Option requires minimum of 4 participants. Registration deadline: August 9, 2017 (inquire if after this date). Read more. Join us September 22-24, 2017 as Get Out & Go Tours, LLC provides its outstanding service and support to the Hemophilia Federation of America (HFA), as we team to raise money for those with rare blood disorders who find difficulty meeting life's financial challenges due to their extreme medical bills. 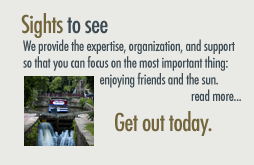 This tour is a tax-deductible (for most) way to experience the C&O Canal with great company, excellent meals, full support, and spectacular scenery and historical sites. We’ll meet near the end of the C&O Canal in Georgetown early the first morning to shuttle to the Paw Paw tunnel on the C&O Canal, where we’ll eat lunch and start using our gears for good. Our typical full support, gear shuttle, lodging, meals, cue cards, and mechanical support are all included. This means you can ride the whole daily distance, or just a portion of it, without worry. Riders cover 30-60 miles per day, depending on their interest and ability, make friends, and share a common goal, while learning about hemophilia. Minimum sponsor pledge (which may be tax deductable and can be made via the website) is $1,000.00 (or about half the cost of a single dose of factor medication). Optional single occupancy $100 additional. Hybrid bicycle rental available for $75.00. Further details, sign-up, and sponsor pledging can be found on the HFA’s website. Watch the video from the 2013 ride. Watch 2012 Video. Watch. Read more. The C&O Canal - Great Allegheny Passage combination trail ride can be done from Washington, DC to Pittsburgh on a quick trip, as this version provides. Participants begin by riding out of Washington, on this a premier, car-free journey, that is a highlight in the Rail Trail Hall of Fame. We spend seven pretty-full days on the trail, riding along the winding Potomac River and over the mountains, in the cooler, fall season, when leaves are at peak color. The tour features 60-70 mile days, with shuttle options for shorter daily mileage, indoor lodging, hearty meals, daily Snack GOs with snacks and drinks, map and cue cards, and time to explore Harpers Ferry, WV, on your way to Pittsburgh. 5-day trip cost $1,100. Optional single occupancy $300 additional. Optional hybrid bike rental, $100.00. Registration deadline: August 9, 2017 (inquire if after this date). Read more. Imagine, no, experience what it was like to travel the canal, and to live as a lock-tender, when you ride with Get Out & Go Tours on our Lock House Living tours. On this journey, you over-night in one or two Lockhouses inside the C&O Canal National Park! You will be shuttled from Washington, DC (Dulles Airport) area to our ride starting point, ride the C&O Canal, over-night in a lockhouse, ride another day on the Canal, over-night in another lockhouse, and finish the tour on the third day. Itineraries may include the Paw Paw tunnel, Antietam National Battlefield, Point of Rocks, MD, Williamsport, MD, Great Falls National Park, and Washington, DC. The tour will include return transportation to the starting location near Dulles Airport. You will have cookout dinner and continental breakfast at the lockhouse each day, with picnic style lunch on-trail. The lockhouse experience is of the period of the 1830s, with no electricity or running water (we bring drinking water) in most locations, which gives you a glimpse into life two centuries ago, a unique and extremely memorable park experience. Cost: $800 per group per trip day. Exclusively limited to 7 participants + 1 staff. Optional hybrid bicycle rental available for $50.00. Includes transportation, meals, trailside support, group sleeping and cooking gear, clean-up supplies, gear shuttle, map and cue. Dates subject to lockhouse availability. 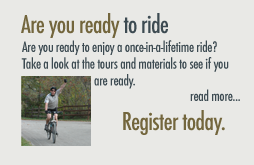 Rent a bike for a self-guided Loudoun County winery or brewery tour, or trip to Morven Park to tour the Davis Mansion. Routes for individual rides, with our rental bikes available, are ready. More routes and options are in development. Corporate and group events available for groups of 8 or more. See our rentals page for details on hybrid, road, mountain, cyclocross, tandem, kids, and trail-a-bikes, trailers, and camping gear. We are located in Ashburn, Virginia, with bike rentals convenient to Leesburg, Lansdowne, Ashburn, Sterling, Herndon, Reston, Great Falls, the W&OD Trail and the C&O Canal. Want to ride in Virginia and DC while on business travel? Let us know your Dulles-area hotel, and we'll arrange for a bike during your stay. Our family-run business appreciates your business. Groups and corporate events are a specialty of ours. Get Out & Go Tours LLC, © 2017. All Rights Reserved.